Seven of every ten Americans will have a headache this year.i What causes headaches? What can you do to minimize the pain or even eliminate the cause? Here are some tips, courtesy of the Virginia Chiropractic Association. Primary Headaches are not related to an underlying disease process such as stroke, cancer, drug reactions, etc. 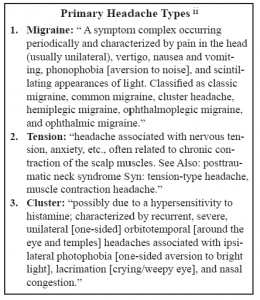 There are three main types: Migraine, Tension, and Cluster (see box). Secondary Headaches are caused by life-threatening and non-life-threatening underlying diseases. Secondary Headaches include infections, tumors, vascular (including aneurysm), drug-induced, or idiopathic (caused unknown). iii Though life-threatening Secondary Headaches do occur, Primary Headaches are far more common. Doctors are trained to recognize the difference, and to refer for specialized diagnostic testing when appropriate. There are many, many prescription and non-prescription medications used to treat or abort headaches. Unfortunately, some of these drugs have a variety of side effects including a surprising one: severe, persistent headaches. Doctors can’t consistently predict who will have so-called Rebound Headaches, and the only definitive way to tell is to take medications and see what happens. Unsurprisingly, many people find that approach unacceptable. Those are “side effects” that any headache sufferer will very much appreciate. iv Spinal manipulation vs. amitriptyline for the treatment of chronic tension-type headaches: a randomized clinical trial. J Manipulative Physiol Ther. 1995 Mar-Apr;18(3):148-54.